Chandler has more lake communities in the Phoenix valley than any other city or town. Chandler luxury waterfront subdivisions include Ocotillo Lakes, Pinelake Estates, Oakwood Hills, Balboa Point at Ocotillo, Embarcadero, Windward, Catalina at Ocotillo, Watermark, and Fulton Ranch. The proximity to many semi-conductor employers such as Intel increases the desirability for high-tech employees. Parks such as Veterans Oasis Park, swimming facilities including Hamilton Aquatic Center and ice skating rinks at Polar Ice in Chandler, and the other Ocotillo Lakes area amenities and top rated Ocotillo Golf Resort add to the attractiveness of Chandler luxury homes. Gilbert luxury waterfront home subdivisions include The Islands, Val Vista Lakes, Crystal Point, Santan Lakeside Estates, Playa del Rey, and Lago Estancia. For those wanting the best possible combination of lake community homes in Gilbert and community amenities such as a multi-million dollar club house, Val Vista Lakes must be on the list. Tempe Luxury Waterfront Properties will showcase the recent development of condo’s along Tempe town lake which include Edgewater at Hayden Ferry, Hayden Ferry Lakeside and Northshore Condominiums. Close to vibrant Mill Ave. and the 202 freeway and the airport, Tempe condo’s have given luxury home buyers more options. Scottsdale Luxury Waterfront Properties include subdivisions at Scottsdale Ranch, Scottsdale County Club, Gainey Ranch, McCormick Ranch, DC Ranch, Lakeside Villas, and Palo Viento. 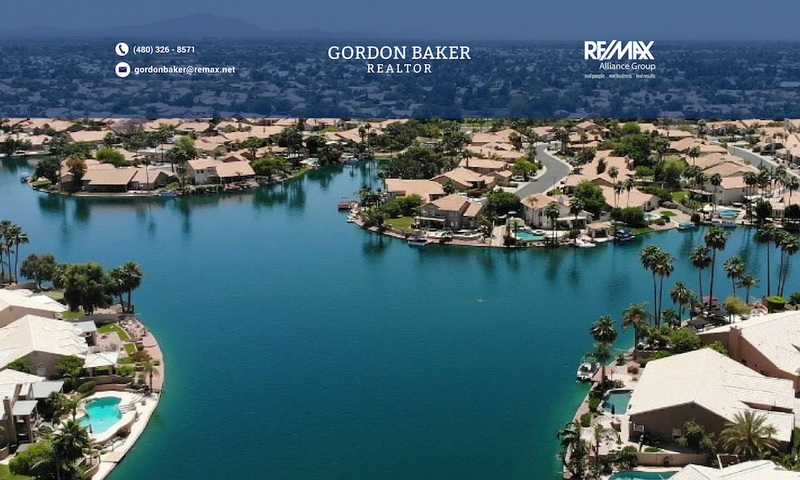 For the serious buyer that wants to combine the serenity and peaceful environment afforded by a luxury waterfront home, the Phoenix area homes will not let you down! More information on Phoenix Luxury Waterfront Homes. Custom VIP Home on 32,000 sq/ft lot, has gorgeous views! House includes granite, tile floors, stone on the front, side entrance garage, snail shower, corner garden tub, large master with sitting area and massive closet, gourmet kitchen and great room style living room. The storage throughout is extensive. Downstairs spare bedroom for guests. Extra room with garage entrance from backyard perfect for workout room/workshop/office not included in sq/ft! RV gate and massive side storage for all your toys. Great Tempe location with quick access to freeways, college and work. Huge loft area for entertaining or game room/theatre. Walk-in closets on the larger spare bedrooms. Large front driveway and three car garage for almost any parking needs. No HOA!! City lights & Mountain Views abound from this very private single story Mcdowell mountain home. Kitchen Updated in 2013 complete with maple cabinets and Bosch appliances. Floor to ceiling windows in the master bedroom. Fabulous 500 bottle temperature controlled wine room. Third garage bay has been converted to bedroom/office. Entertainer's dream backyard with fire pit, BBQ, and Pebble Tech Pool with unobscured preserve views as your backdrop to your outdoor oasis. CLASSY, semi- custom SINGLE LEVEL in the MOON VALLEY CANYON subdivision offers ELEGANT COLUMNS, VOLUME CEILINGS and custom MIRRORS. Included are FOUR large BEDROOMS plus OFFICE, 3.5 UPDATED BATHROOMS, MASTER SUITE with sitting area plus WALK-IN CLOSET. UPDATED KITCHEN with GRANITE, custom stained cabinets & LARGE PANTRY. FIREPLACE and CUSTOM PAINT, DUAL PANE windows and STORAGE galore. 20X20 neutral TILE and NEW CARPETING throughout (1/19) DUAL ground mounted A/C THREE CAR GARAGE with extra CABINETRY. ROOF WARRANTY. PEBBLE FINISH POOL and GRASS REAR Quiet CUL-DE-SAC lot .& RV GATE LOOKOUT MOUNTAIN TRAILHEAD less than two blocks away. Close to many restaurants & shopping around 7th Street and Bell. PARADISE VALLEY SCHOOLS WITH PRE IB AND IB PROGRAMS. Good to see that waterfront homes are selling. Seattle waterfront real estate is starting to pick up again.